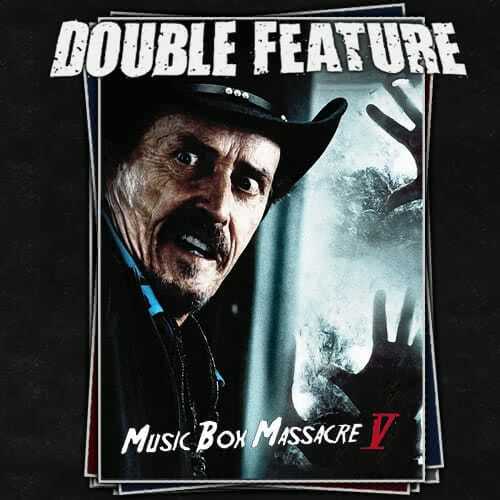 UPDATE: There’s an hour long podcast episode about Music Box Massacre 5 on Double Feature. While each film stood on it’s own merits, the pairing and the order in which they were arranged was mostly a failure. The Hunchback of Notre Dame was an odd way to start (as well as an odd inclusion, not nearly as well thought out as last year’s Old Dark House). Sticking The Black Cat (essentially a Masters of Horror TV episode) in as the third Stuart Gordon pick was a bad move, even though I love Stuart Gordon. The worst choice of the whole thing was Dark Night of the Scarecrow – I felt so bad for the creator, who showed up for a Q&A. You stick his film right after Pontypool? And up against other the other big-guns? It was the wrong format to show an ’81 made-for-TV movie anyways, but putting it that late at night was just incompetent. None of that actually maters compared to what actually ruined the evening for a lot of people – they had this guy who calls himself Rusty Nails introducing each movie. I don’t even know where to start on him. He likes to think of himself as a Chicago film personality. You’ll see him around film events in the city. He’s kind of an egotistical douche bag, but he’s fairly easily ignored. Well, usually anyways. Not last night. I’ve grown to expect really bad jokes, a complete lack of real enthusiasm, and these embarrassing costumes. I know that when he “interviews” someone, it feels like watching an awkward middle school presentation…but I can usually ignore that. I mean, I feel embarrassed for the guests (who’s time is totally wasted…you should have seen how Art Hindle reacted to his questions!) How awesome the Music Box is generally outweighs everything this guy does to ruin the experience every year. This year was just too much. It was just way too obnoxious. What was especially sad is to see that NO ONE was bidding on the charity stuff because the overall moral of the crowd was so low. I mean, you could feel how much everyone hated this guy! With each movie, more and more people around me were mumbling “jesus, enough already” under their breath. Had they gotten someone the crowd actually liked (and not someone who talked through the important dialogue at the end credits of Ponypool or someone who invited audience members to scream shrill heavy metal noises into the mic) the Music Box would have raised a lot more money. Anyways, that kind of turned into a rant. It was good to see everyone who came out…but if that guy’s around next year, I won’t be there and therefore I don’t see Double Feature hyping the event again. 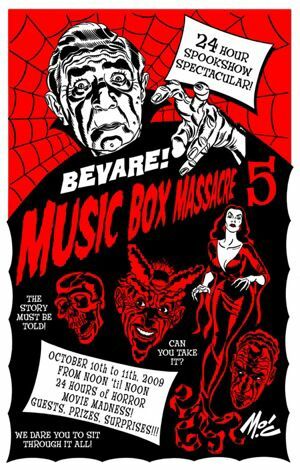 Music Box Massacre 5 will be our last Music Box episode.